I have a doctorate of music, teach university, and 5th-12th grade students. I play both classical and jazz. Hi! My name is Dr. Carl Spaeth, and I am a musician and educator based out of Oklahoma. I’ve been teaching for nearly 10 years now, and have held positions as a university lecturer, public schools teacher, and online lesson instructor. I have doctorate and masters degrees in saxophone as well as a bachelors degree in music education. While saxophone is my primary instrument, I also play and teach guitar, piano, bass guitar, flute, clarinet, oboe, music technology, music theory, and jazz improvisation. I’m glad to see that you’re interested in private music lessons with me! My students range from ages 6 and up and include beginners up to graduate students. While my lessons are fit to individual needs, my students also benefit from multiple handouts and exercises that I share with them. I love sharing my passion for music with others, and I hope to hear from you soon so we can work together to achieve your goals during your musical journey. See you in class! Dr. Carl Spaeth is teaching at Oklahoma State University as a Lecturer of Saxophone and Music Theory during a sabbatical beginning August 2017. His duties include graduate saxophone lessons, graduate music theory review, graduate saxophone pedagogy, and saxophone studio class. Spaeth has an online music studio, where he teaches several instruments privately and in group settings including saxophone, guitar, oboe, music theory, flute, clarinet, and piano. 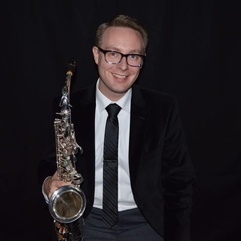 Spaeth completed his Doctor of Musical Arts degree in saxophone performance at the University of Kansas in 2014, and his Master of Music Pedagogy and Performance from Oklahoma State University in 2011. He graduated from Harrah High School in 2002, earned his Bachelor of Music Education from Southwestern Oklahoma State University in 2008, and was a 5th-12th grade Head Band Director at Fairview Public schools. While at KU, Spaeth was also a graduate teaching assistant for the saxophone studio and jazz studies program. While at OSU, Spaeth was a Graduate Teaching Assistant for the saxophone studio and music theory programs. Dr. Spaeth is a Conn-Selmer Endorsing Artist. Master of Music Pedagogy and Performance (Saxophone) and Graduate Teaching Assistant for Saxophone and Music Theory. Director of Bands for 5th-12th grade public school band program. Dr. Spaeth is an amazing teacher. Knowledgeable, patient, easy to understand, and a great teacher for all skill levels. He is a great musician and impressive improviser." Carl S. is a FANTASTIC performer and educator. I've seen him perform and teach in a variety of settings, and I respect him immensely. He is a wonderful, compassionate, motivated teacher. I wouldn't hesitate to send any student looking to improve their musical abilities. You will have made the right choice!" Take live online video lessons with professional, passionate Saxophone teachers from around the world. All you need is a computer equipped with a webcam and microphone. Learn more about how it works.